and Douglas Head Marine Drive, Ltd.
Douglas Head Marine Drive, Entrance Gates. 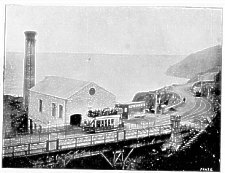 Douglas Southern Electric Tramway Co.s Power Station, Pigeon Stream. 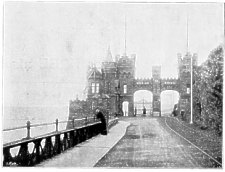 THE MARINE DRIVE, upon which is laid the Electric Tramway, is in some respects, unique. It starts at Douglas Head, at a point about 150ft. above the sea, affording a fine view of Douglas and harbour. 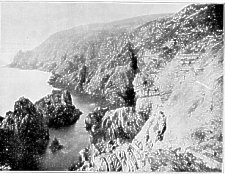 From this point it follows the precipitous and broken coast line of the island in a southerly direction, undulating, but continually rising until Walberry is reached, about 300ft. above the sea. The scenery at this point is excessively wild and rugged, the rocks rising precipitously 150ft. above the track on one hand, and falling almost straight into the water on the other. At this point the Tram-way crosses a wild and rugged ravine, upon a steel bridge some 250ft. long. There is then a gradual descent until the Whing is reached, where the roadway swings round this in an imposing horse-shoe curve, then, winding and twisting round the conglomerate bluffs of Keristal and Rhe Bog, finally reaches its terminus l00ft. above Port Soderick, and 3 miles from its commencement. 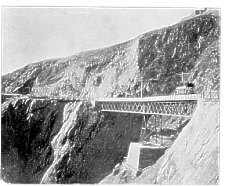 Walberry Bridge (steel structure) 200 feet above Sea level. From Douglas Head to Port Soderick cars run every ten minutes. From Douglas to Douglas, either via Douglas Head or the Castletown Road Entrance at Oakhill is about 8½ miles. Rock Scenery from the drive showing Nuns Chair in the distance.